An accommodated adventure tour that has it all. Visiting a number of National Parks we can expect incredible wildlife sightings. The traditional Kingdom of Swaziland and Lesotho offer fantastic opportunities to encounter the local tribes and traditions. 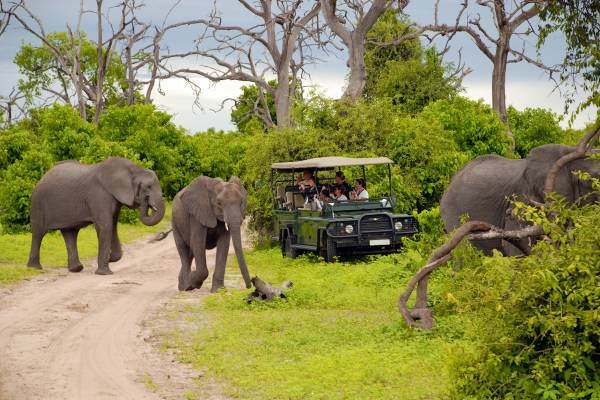 This safari tour offers a good insight into South Africa. We leave the City of Johannesburg and head east to the “Lowveld” – where most of South Africa’s wildlife reserves are found. 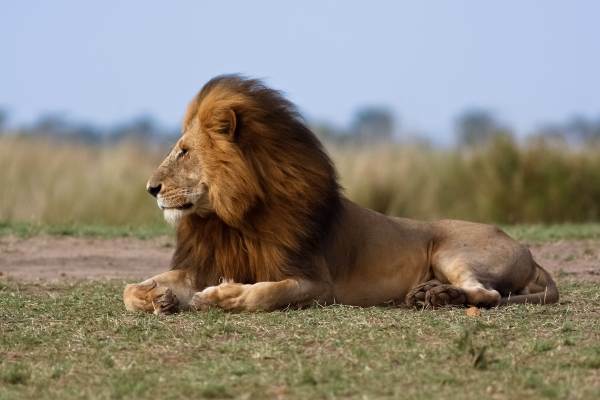 The conditions are ideal for game, and the Kruger Park is known for its abundance of animals and perfect for safaris. We set up camp in the Greater Kruger area. Opportunity for sundowner safari – time allowing. The day is spent exploring the Kruger Park. The Kruger is home to a wide variety of wildlife and one can expect to encounter large hers of game. Elephants, giraffes, zebra, antelopes and predators are common sightings. The open vehicle game drive allows for excellent viewing and photographic opportunities. There is a second opportunity for an optional Sun downer tour. For those wanting to do the morning bush walk have a very early start. We then head to the popular and scenic Panorama Route. We visit God’s Window, Bourke’s Luck Potholes and the amazing Three Rondawels. Fantastic views – cameras ready. Another early start as we head off on our final game drive through the Kruger Park and an opportunity to spot any of Africa’s famous Big 5 which we may have not yet seen. We exit the park in the south and head to the Kingdom of Swaziland. Crossing the border into Swaziland we head to Milwane Nature Reserve..
Today the pace slows down. Milwane Nature Sanctuary has few dangerous animals which allows for self exploration. A guided walk will take us through the sanctuary.The afternoon sees us visiting the local community and an opportunity their view the daily life. This interactive experience could allow you to try your hand and grinding corn, carrying water and more. This morning we sees us leaving Swaziland and entering the traditional tribal lands of the proud Zulu nation. 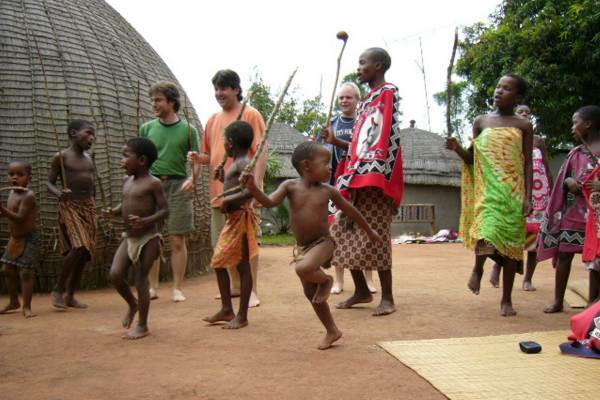 This evening there is an included cultural evening where you have the opportunity to experience Zulu traditions. We set off on an early morning game drive into the Hluhluwe- Umfolozi Game Reserve. This national park is home to the Big 5 and is especially known for its high concentration of both black and white rhinos. The park is an integral part of the ongoing war against rhino poaching. After an informative game drive we head back to camp for a well-deserved rest. The late afternoon sees us heading out on a boat cruise on St Lucia Estuary – a World Heritage Site. Today we head north to the dramatic Drakensberg Mountains - a World Heritage Site. En route we stop briefly in Durban before heading for the mountains.We visit the impressive Howick Falls – with its 95m of plunging water. Howick is also famous for being the place where Nelson Mandela was apprehended by the “apartheid police”. The Drakensberg Mountains are spectacular and is referred to as the “barrier of spears” in Zulu. The area is known for its fantastic hiking with a choice of trails available to suit your level of fitness. Hike to pristine waterfalls or take in some ancient San rock art. Our journey continues as we traverse a mountain pass and have a brief visit at a vulture restaurant/center where we hopefully have an opportunity to view these endangered scavengers. We pass through the “Golden Gate” and cross over into the “Mountain Kingdom of Lesotho”. Passing through the capital - Maseru – we climb the mountains to our base at Malealea. We explore the surrounding mountains and visit a local Basotho village. The Basotho have a very distinctive culture and are easily recognisable by their traditional blankets and hats. There is an opportunity to do some pony trekking. After crossing the border back into South Africa we head across the “Grater Karoo”, and experience a total change in South Africa’s ever changing landscapes. The Karoo is desolate and dry and popular for its sweeping vistas. Graaff Reinet is one of South Africa’s oldest town’s and has rich history. We travel across the dry Karoo as we head for the Addo Elephant Park located close to Port Elizabeth. Waking early we spend most of the day exploring this well-known National Park. The Addo is famous for its Elephants and is also home to many other types of animals and we are bound to have some spectacular wildlife sightings. There is an option to do an additional late afternoon/sun downer safari. This is conducted in 4x4 open vehicles. We leave the Addo and head to Port Elizabeth where our tour comes to an end. Activity Package - R2 750 - This includes what we consider to be the key activities on this tour, A Breakdown of this payment is available from our consultants.